Beaded lace fit and flare wedding gown with sheer bodice, plunging neckline and delicate cap sleeves. Mesh tulle wedding gown with crepe bodice and off shoulder neckline. Duchesse Satin a-line wedding gown with piping along halter neckline, sheer deep V-neckline and adorned by a beaded belt at the waist. Lace applique and beaded fit and flare wedding gown with shoulder and chest cutouts and dramatically long bell sleeves. Sheath crepe wedding gown with delicately beaded lace bodice, V-neckline and illusion lace buttoned back. Sheath wedding gown with crepe skirt and sheer V-neck bodice with textured lace. A-line lace wedding gown with deep V-neckline and back, adorned by textured 3D lace appliques and subtle hints of beading. 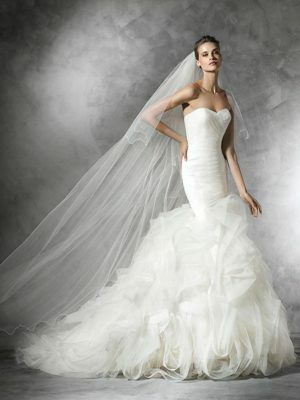 Strapless sweetheart mermaid wedding gown of ruched tulle and dramatic horsehair skirt. Fit and flare Chantilly lace wedding gown with sweetheart neckline with spaghetti straps and draped Chantilly lace sleeves. Guipure lace fit and flare wedding gown with V-neckline and off should cap sleeves. Soft organza a-line wedding gown with sweetheart neckline, cross-over gathered bodice, spaghetti straps and gorgeous draped off-should sleeves. A-line silk dupioni wedding gown with plunging V-neckline and beaded applique on the front and back bodice.